For many industries, winter can be the most nerve-wracking time of the year. Short days, cold weather, slippery roads…it all contributes to a general feeling of uncertainty. While the months leading up to the holidays might be grand, the mid-winter months that follow that can wreak havoc on a company’s bottom line. One of the easiest things you can do for your business during the winter months is to keep yourself in front of your customers. Post regularly to your social media accounts, attend any local winter events that might be happening (either as a vendor or as an individual), and ALWAYS carry business cards when traveling. You never know where your next customer might be discovered, and having a business card ready will help them remember your name once you part ways. If you are a restaurant owner who knows the beautiful cabin next door is a favorite spot for winter weddings, making your presence known as a potential catering service is a must. If you are a horse farm, opening up your trails to snow shoers, cross-country skiers, or even snowmobilers and creating a checkpoint can generate more awareness for your location and ultimately bring you more business. If you’re a photographer, consider attending events that might not typically have a photographer because of harsh conditions–fill a need when you find one! In the aftermath of the holidays, most people are more budget-conscious than usual. Try offering discounts, coupons, buy-one-get-one deals, gift cards, or referral bonuses to draw in customers. Avoid the trap of offering too many discounts before the holidays–many people wait until afterwards to make larger purchases because they are able to get better deals. Maybe you’re a landscaping company whose primary source of income is tending lawns, and you want to raise awareness for your snow-removal division. Hosting a snowman-building competition at your office for local families could help you make some much-needed connections and increase business. Take advantage of slower times of the year and update your website or blog. While a complete redesign might not be in the budget, adding or replacing photos with ones of recent projects, writing new informative articles, or sending a few new email blasts can give potential customers a fresh new take on your company. Interested in buying photos via our online galleries? 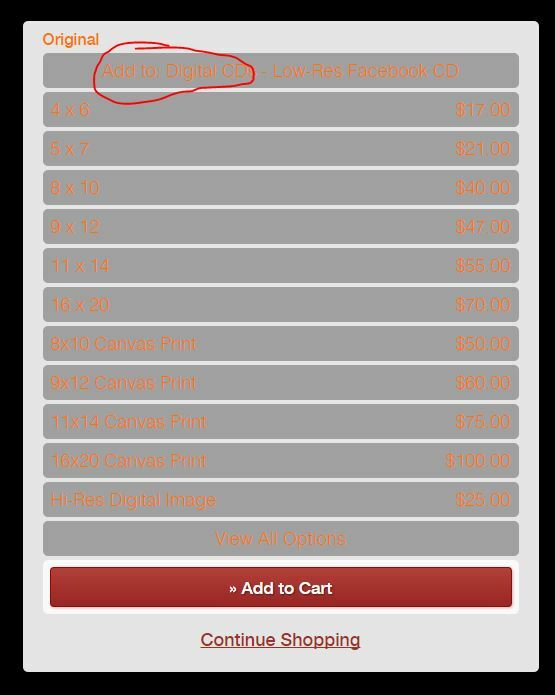 Here are some quick tips to help you find and order your photos! Our online galleries are searchable by your exhibitor number. Simply select your event (SOEE, NYSQHA, etc.) and then on the following page, type your number into the search box in the upper right hand corner of the page and ALL photos tagged with your number will be displayed! If you can’t find your photos this way, it is possible we couldn’t see your number when we tagged the photos. Try typing “unknown” instead. 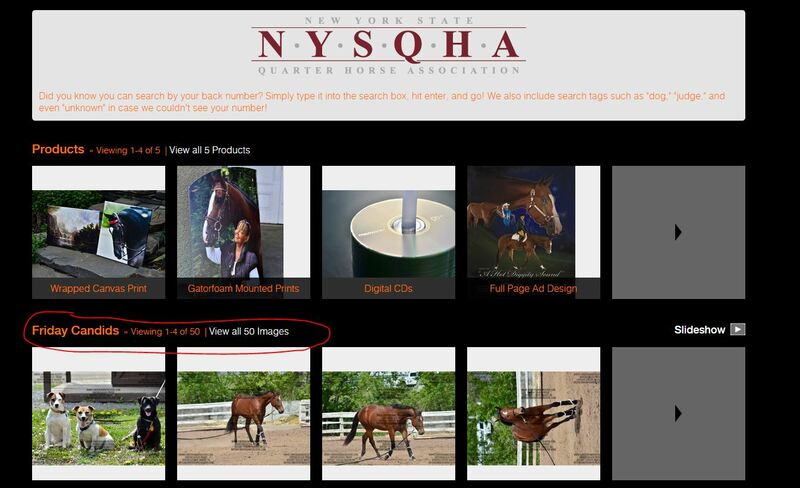 You can also search for things like “dog,” “judge,” and “leadline,” among others. While we do not use every tag at every show, if you are searching for something in particular, it is worth giving it a go! Trying to order a Create Your Own CD? The following tutorial should help you out. Select “Digital CDs” from the product list at the top of the gallery. Choose your preferred CD option (Facebook, Medium Res, or High Res) and add it to your cart. Return to the event page and select a gallery or photo. Once you are viewing an enlarged photo, click “Buy This Image” and a new menu will appear. 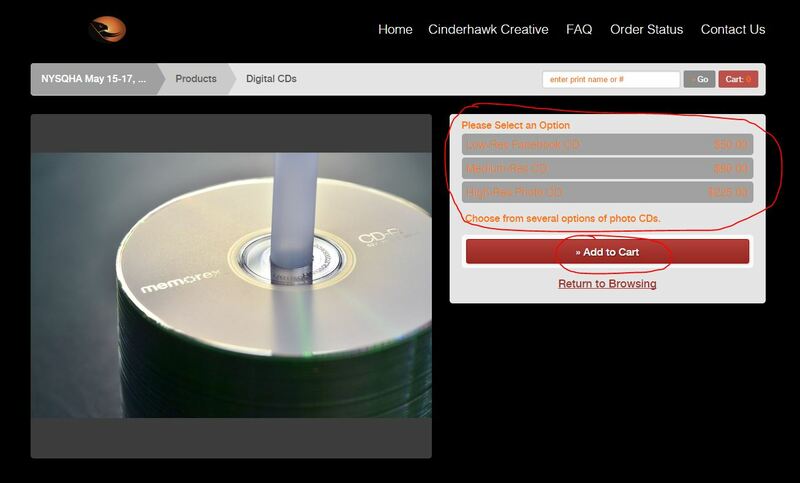 Select “Add to CD” at the top and change the QTY to the number 1 (you only want 1 copy of that image on the CD). Our Facebook and Medium Resolution CDs allow up to 20 photos. High Resolution CDs allow up to 10 photos. Continue through your photos and repeating steps 5 & 6 until you have reached the maximum quantity of images. It will alert you if you have reached the limit. Click on your “Cart” icon in the upper right to view your list of images and check out! The arrow in the following screenshot is a count of how many images you have used of the allowed 20. Rescue Operation? You will want to read this! 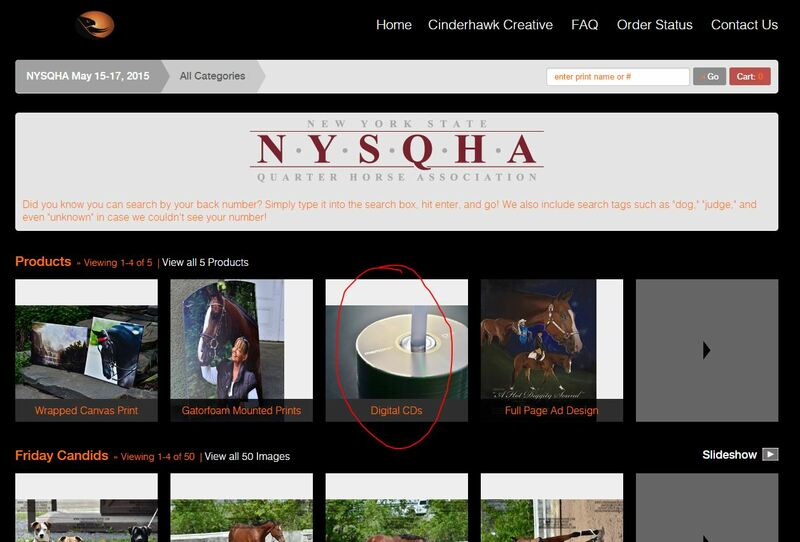 In an attempt to give back to the communities that have allowed us the opportunity to grow, Cinderhawk Creative offers free photography to non-profit equine and canine rescue organizations located within 50 miles of Warnerville, NY. We understand that most of these organizations operate solely on donations and that many may be otherwise unable to afford the quality photography we can provide. We believe that having superior photographs of an animal available to potential adopters is critical. These photos can be captured in a way that highlights the most important aspects of each animal’s individual personality and makes them more likely to be adopted. If your organization is in need of our services, please don’t hesitate to contact us. Your needs are as important to us as they are to you! 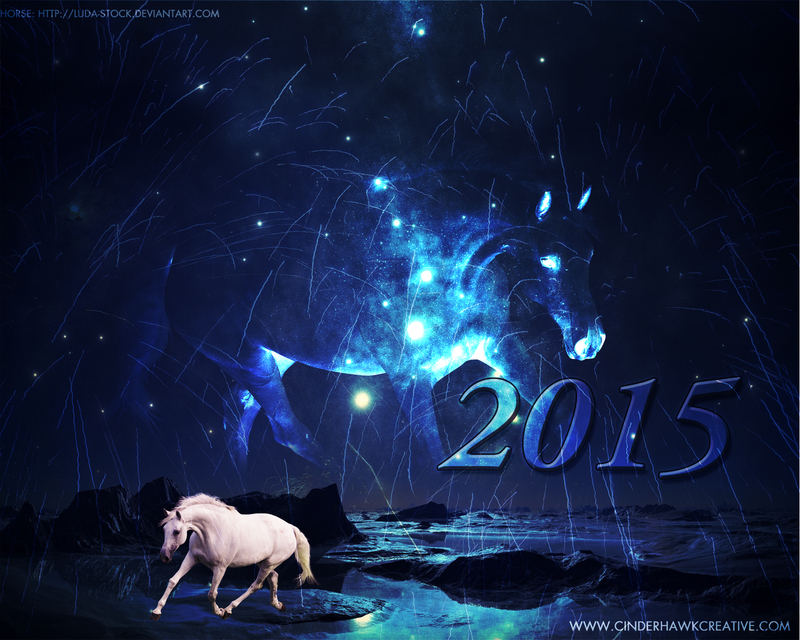 Ring in the New Year with our FREE downloadable desktop wallpaper! Additional sizes coming soon! Download our FREE 2015 desktop wallpaper! A few days ago, a woman approached me with several questions about her fledgling business–a beginner horseback riding lesson program in Upstate New York–and how she could make it grow. As it stands now, she has a fairly loyal customer base, but their payments do not provide her with an income that is steady enough to support herself and her family. Her full time work schedule means that she can only offer lessons on the weekends and often results in her working 6 to 7 days per week. She is working with a limited number of lesson horses on a small farm with a very small indoor arena. To me, this seemed like a pretty difficult position to be in, but one that I thought many other farm owners could relate to. In this article I will touch on some of the methods by which instructors–or pretty much any equine business owner–can help their business to grow by attracting new customers. Competition between riding programs is rather fierce these days, as many families elect to forego the weekly riding lessons of the not-so-distant past due to tighter budgets and time constraints. Sometimes a student may have to travel great distances to reach a horse farm. The cost of travel, combined with the cost of the lessons themselves, can very quickly turn into the same amount one might spend on a new car or their monthly rent. When weighed against other expenses, riding lessons may take the back seat. Instructors often need to be not only well-known, but capable of teaching more than just one specific discipline. They must have horses for every rider’s experience level available to them at all times. One mishap or otherwise poor experience can cost an instructor both that student and their reputation as an instructor. That being said, with proper business practices, it is still possible to gain customers and make a living in this field. Are your clients happy with your program? Chances are, if they keep coming back and handing you money, that answer is yes. Remind them to tell others about you and your business. If you can, give them an incentive, such as a referral program that provides them with a free lesson if they bring in a new customer. Offer to give the lesson at the customer’s own location if you can. Word of mouth advertising is extremely powerful–more powerful, even, than social media and print advertising combined. You can’t be sure that someone will spread your name around after a positive experience, but you can be darn sure people will hear about a bad one. Make sure everything that’s said about you is positive! If you aren’t on Facebook, you need to be. Although this social media giant is typically seen as a method for connecting with friends and family and sharing every insignificant detail of your life, it is also a dominant marketing tool for businesses. Facebook advertisements can easily reach thousands of local customers for a very reasonable price. I spent $5 on my last ad campaign and reached 717 individuals. I received 4 new wall posts and over 30 new likes in just the two days the campaign was running. That may not seem like a lot, but every like increases your business’ online “range.” Once a person likes your page, there is an increased chance of your business showing up to their friends as well. Considering the average number of “friends” per user is over 300, that means my business now has the potential to reach about 9,000 more users. That $5 investment doesn’t look so wimpy now, does it? Facebook also allows businesses to track their page “insights,” including the age, gender and location of the users visiting the page, as well as what they are viewing most and when. Knowing which posts are the most effective at drawing attention is a valuable bit of information for any company, large or small. Users can also join Facebook groups that pertain to their business. There are hundreds of local groups for horse lovers, horses for sale, horse-related discussion forums, and more. Join and participate in as many of them as you can. It’s all about networking. Sending out bi-weekly or monthly emails to your clients can be an efficient way to keep ahead of your competition. A good email subject line, relevant and interesting content, and easy access to your contact info are a few surefire ways to get results from your email blasts. The most straightforward way to collect emails from potential clients is to ask for them. Collect business cards from people and you’ll notice that many of them include an email address. Using an email client such as MailChimp will allow you to create a signup form that can be added to your Facebook page or website, as well as allow you to view your email lists and the results of each email campaign. Don’t use your email blasts just to advertise–make each email worth opening. Offer tips and tricks, savings coupons, event invitations, contests and useful articles to keep your customers opening and reading your emails time and time again. I cannot stress this enough. It is a proven fact that the more often a business appears to customers, whether it be through personal interactions, business cards, fliers around town, or on the web, the more apt that customer is to remember your business name. Obtain professional business cards and a well-built website. Invest in a sign for the end of your farm’s driveway if possible. Attend seminars and clinics to heighten your skills. If you travel a lot, turn your vehicle into a rolling billboard for your program while you’re at it. Attend shows and events with your students to reap some of the benefits of their blue ribbons when people ask who their trainer is! Do you have any suggestions for how to bring in customers? Comment below and tell us!